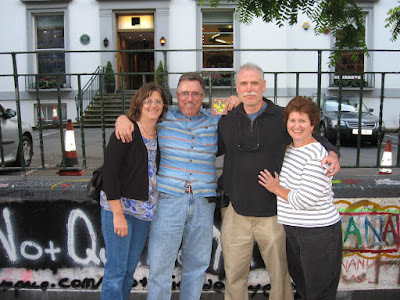 Greetings from the "Road"...Abbey Road Studios that is! This was just Day 2 of our trip that we are now more than half way through already. Photo by Sir Davyd of Oxfordshire, who "hooked" up with Sir Hook and Gang at the Globe Pub on Baker Street. Little did we know the adventures that would await, or for that matter, still await us on this ultimate "Road Trip"! Finding time to unwind in a village Inn and Pub, Queenshead in Milton Ernst, I was finally able to download the first of 546 pictures taken since Day 1. 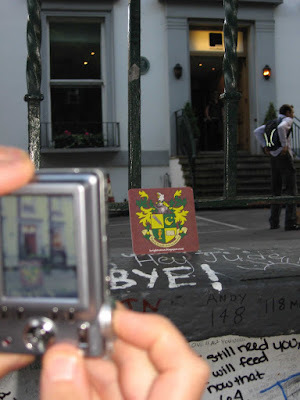 Being Beatles fans, all four, the Houses of Warrick and Greenbriar, enjoyed leaving KMSA Coasters and adding to the profound graffiti on the walls in front of the studio. Today we drive 3 hours to Somerset, home of my ancestors, and take in Bath, Wells, Salisbury and Stonehenge before arriving back in London next week. Why don't we do it in the Road?! We did!